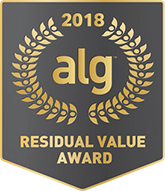 Land Rover has been honored with five awards at the prestigious 2019 ALG Residual Value Awards. These awards honor outstanding achievement in retained vehicle value after three years. That means the awarded vehicles are expected to retain more of their original purchase price, thus creating a better value for the new vehicle buyer. Land Rover received the very impressive ‘Best Premium Brand’ award plus category awards for four of our performance SUV models. The Land Rover Discovery Sport topped the ‘Best Premium Compact Utility’ category, the Land Rover Discovery was honored as the ‘Best Premium Mid-Size Utility 3rd Row Seating’, the Range Rover was awarded ‘Best Premium Full-Size Utility’ and the Range Rover Sport was the ‘Best Premium Mid-Size Utility 2nd Row Seating’ for the twelfth year in a row! Land Rover Colorado Springs has a super variety of these luxury performance SUV models for you to choose from. Stop by today and take a test drive of your favorite. Our knowledgeable staff is eager to show off the many impressive features of these beautiful Land Rover vehicles!